Beauty... is the shadow of God on the universe. While I was beautifying my gardens in the mornings and on cool days and some evenings, I was secretly starting a business in afternoons, during bad weather, and other evenings. Remember My Love Bracelet? Well, I really loved those beaded charm bracelets so much that I toyed around with the idea for months and then I finally justified my desires with the concept that it would be a very good opportunity to teach my daughter about entrepreneurship. The Princess had been having fun making the Rainbow Loom bracelets that so many of her friends were also making and she talked of selling her creations but the problem is that so many girls are making them that there is no market. I tried to help her understand the concept of supply and demand in marketing. It is fine for her to enjoy making the rubber band bracelets and she even came up with a few of her own designs! However, it was probably always going to be a hobby, rather than a means to make a bit of coin. With her desire to create things to sell and make some money...and the fact that we were both into bracelets...and that the beaded charm bracelets were so much like the expensive Pandora bracelets but could be sold at a fraction of the price--Imagine the cost of a completed bracelet matching or being less the cost of just one Pandora bead!--I knew that many of the women in my area would love to have one (or two or three). Then they would also love get some for friends and family as gifts because they really are quite lovely, fun, and affordable. 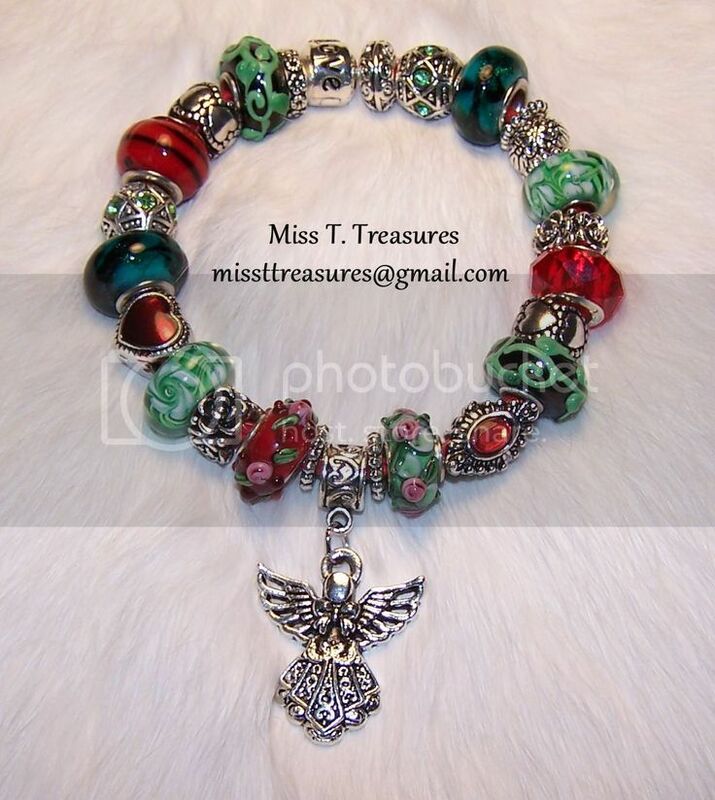 So, I began looking into sources for good quality glass beads, charms, and bracelets. My bracelets and charms are not sterling silver, but they are lead and nickel free, which was important to me because I am allergic to nickel. After making a few bracelets that I personally liked, just in case I would not sell any, I just matched what I was wearing whenever I went out and interest just happened...except it seemed that everyone wanted colors I did not have at the time so, of course, I had to order more beads, then it was some wanted more bling, and then...you get the picture. In testing the market, we found that the prospects look promising and, hopefully, the Princess is beginning to understand how to create a market because that people tend to want what they see and do not yet have. I can spend hours looking at beads and charms to buy and more hours playing with combinations of them. It even surprises me how much I am enjoying this! I spent several days with the camera and lighting equipment I had on hand testing how to take the best photographs of these beaded beauties. Above is one I call "You Need a Little Christmas." Then I posted them on Pinterest under the name of Miss T. Treasures and I have a few more to post yet too. So, you can see I now have a wide variety, but the cool thing, besides I can wear any as my favorite for the day (which is difficult to choose and so very, very nice! ), is that everyone can personalize her own bracelet. I have made some that might be close to what a person would like and then it is just a matter of getting the right bracelet size and switching out a few beads and charms they do not like want for the ones they do. I am not planning to do this as an online business, presently, but who knows? I just think the bracelets sell themselves better in person. So many bare wrists and so few bracelets! The Princess is starting her STEM classes next the Tuesday after next and then my errand day will go from the typical 6-7 hour trek to probably a estimated 12 hour nightmare with us getting up at 5:30, leaving by 7:00 and maybe getting home around 7:00, unless I can find a way to avoid the rush hour traffic, and I will still have groceries to put away! Rainbow Angel is new too. I liked that also. I'm not much into pink so a lot of the cooler colours with less contrast work for me. Yes, I planned to make a rainbow one eventually which would definitely be a favorite for me also, but a friend requested one to give to her mother (before I had beads in all the colors I needed). So did not want develop an attachment to this one, because I cannot keep it...but I can make another one!